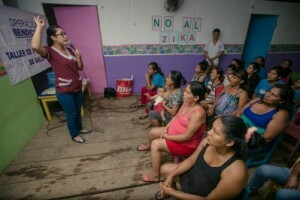 In the month of March, Worship In Action is partnering with Operation Blessing (one of America’s most proactive Christian charities) to combat the spread of Zika virus in Central and South America. This outreach will provide families living in hardest hit areas with insect repellent; bed nets; fumigation; education about the virus; and assistance cleaning areas where standing water breeds mosquitoes. 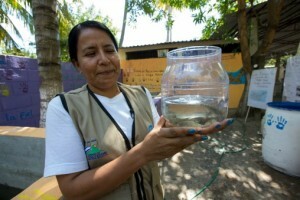 Mosquito-eating fish such as Sambo, Tilapia, and Gambusia are also placed in water sources to eat mosquito larvae. This as a low-cost, practical way to stop the growth of mosquito populations in and around homes where the virus spreads. What is Zika virus? How Does It Spread? Zika virus is similar to other mosquito transmitted diseases such as Dengue, Yellow Fever, Japanese Encephalitis, and West Nile virus. It spreads to people primarily through the bite of an infected Aedes species mosquito during daytime hours. Aedes mosquitoes live and breed in water vessels, which commonly store water around homes without indoor plumbing systems. The World Health Organization has declared the Zika virus a “public health emergency of international concern.” And, although the virus currently impacts Central America, South America, the Caribbean, and the Pacific Islands, cases have also been reported in the US and elsewhere. Pregnant women and their fetuses are especially vulnerable. Zika virus can spread from pregnant mother to her baby. Scientists have linked a serious brain birth defect in developing fetuses called Microcephaly to Zika virus. Babies born with Microcephaly have noticeably smaller heads than healthy babies; and consequently, suffer permanent brain damage. The Centers for Disease Control and Prevention recommends special precautions be made for pregnant women to protect them from exposure to the Zika virus. Thank you for joining us this month as Worship in Action partners with Operation Blessing to combat the spread of Zika virus in Central and South America. 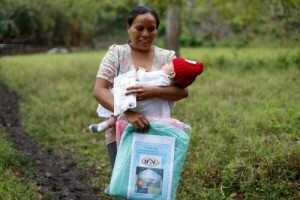 Donations given to this Zika virus outreach will provide insect repellent, bed nets, fumigation, and mosquito larvae eating fish to impoverished communities where the items are most needed. Let’s put our worship into action this month by stopping the Zika virus, and powerfully impacting lives in the name of Jesus Christ.